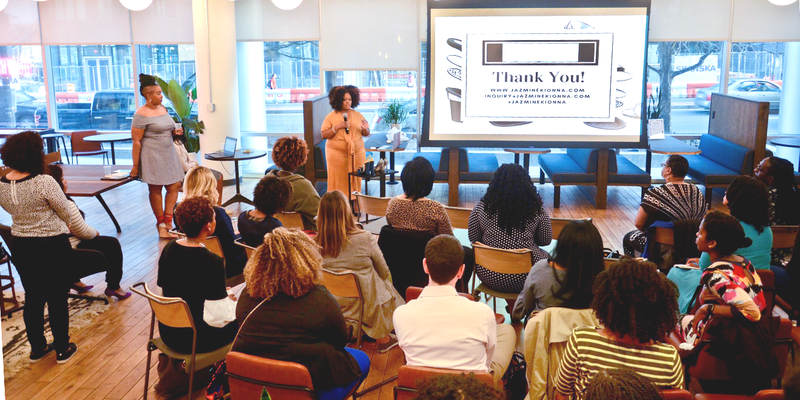 Black Girl Ventures, which hosts business pitch competitions for women of color, has been a key part of Washington's inclusive startup community. The imbalance is well documented: The vast majority of funding in the entrepreneurship world goes to men—white men in particular. According to one analysis, roughly 2 percent of venture capital funding in 2017 went to all-female teams, compared to 79 percent that went to all-male teams. A March 2018 report from the National Women’s Business Council cited a wide range of issues holding back women in entrepreneurship, from a lack of high-level networking opportunities to a systemic bias through “an unconscious association with less credibility and a lack of legitimacy” compared to men. But the entrepreneurship community in Washington, D.C., has been quietly working to disrupt the paradigm of who gets to be a disrupter. Washington is a city that is minority-majority and also female-majority and, estimates have shown, has the highest concentration of LGBTQ-identifying residents of any city in the country. It has also emerged as a budding tech hub, albeit a bit late to the game. Through a combination of community resourcefulness, demographic diversity, local government cooperation and good timing, D.C. has shaped itself as the top city for inclusive entrepreneurship. The term “inclusive entrepreneurship” was coined in a decade-old project based in New York that looked at improving access to resources for entrepreneurs who identify as having disabilities. Today, the phrase has expanded to cover all efforts focused on closing the funding and resources gap that persists between stereotypical Silicon Valley founders and pretty much anyone else trying to start a business. There is no better place to put the theory into practice. D.C. has historically had high numbers of businesses owned by minorities, especially women. It’s a trend that does not appear to be reversing itself any time soon. According to a 2018 report from Beacon: The D.C. Women Founders Initiative, Washington, D.C., though technically not a state, is “one of the 10 fastest-growing states for women-owned businesses in the U.S.” The 2016 State of Women-Owned Business Report commissioned by American Express Open found that nationally, “there has been a 45 percent increase in the number of women-owned firms over the past nine years,” and in D.C., the growth rate was 51 percent. But this grim reality has also sparked exciting new projects aimed at supporting women of color in entrepreneurship, with many of them based in D.C.—and working to improve D.C.’s entrepreneurial scene, too. Amy Millman, president of Springboard, a D.C.-based “network of innovators, investors, and influencers” that focuses on supporting female-led technology-oriented companies, recalls the way D.C.’s female entrepreneurship scene has evolved in the years she’s been in the city. "[In 1989,] I ran into significant systemic barriers to starting a business. I am a woman. I am black. I’m not sure if being gay played a role. The bias was overwhelming." With the hub of that energy in D.C., it was inevitable that members of the team would begin working with D.C.’s own assets. One example: Donna Harris, former managing director of the Startup America Partnership, went on to cofound 1776, which connects startups around the world with D.C.’s unique resources and networks. Meanwhile, the Case Foundation, which is based in D.C., has become a major pillar of the inclusive entrepreneurship movement. Naomi Shavin is a DC-based writer and editor whose work has been published by Vox, the New Republic and more.